Long distance train travel is a unique experience. You'll meet a range of people you wouldn't if you traveled any other way. You'll see some parts of the country exactly as they were seen by someone traveling in a train a century ago - there are still places that are brush as far as the eye can see with no signs of civilization for miles. I love to sit back and watch the scenery go by, whether at 20 miles per hour or 80 miles per hour (or even zero miles per hour.) There are scenes you see from the train that would be straight out of The Big Book of Typical Americana. Yes, there are corn fields in Iowa and they go on forever, and right in the middle of them is the stereotypical farmhouse, barn, and silo. There are places in the Southwest where all you can see are mountains and brush, where you would half expect to see an Indian on horseback up on a ridge looking down at your train, and where you may actually see a pair of cowboys on horses driving cattle. The Rocky Mountains really are called "rocky" for a reason. So is "Colorado". But did you know that much of Colorado is as flat as Kansas, and with the same farms? Same thing goes for Montana. You'll also discover one of the constants of the United States - people abandon cars everywhere - in ditches in the desert, at the back of their property in Nebraska, and anywhere else they'll be out of view to the general pubic...unless, of course, the general public is in a train. You'll meet the most interesting people on a train. In my travels, I've met a drunk lady who thought I was gay, a conspiracy theorist going to San Francisco but with no idea how he was going to get from Emeryville (where the train stops) across the bay, a guitar player who entertained the lounge car halfway across Arizona and New Mexico, a man who bicylced his way throughout Peru, a group of kids from Minnesota coming home from a field trip in Chicago, a guy who was going from Portland to San Diego so he could hike the Pacific Crest trail, two punk-rock girls who managed to get a free bottle of wine from the lounge and stayed up 'till the wee hours in what is no doubt the goofiest night I've ever spent on a train - or anywere else, a travel group from the UK who were exploring America by rail, a lady from Orlando who has been without a doubt the best travel companion I've had so far (but who I probably would have never met anywhere else but the train), a couple of kids traveling from Santa Rosa California to Chicago but who only made it as far as Omaha because it seems they were traveling with a suitcase full of cocaine that the DEA didn't approve of, and several other odd and not-so-odd people. Traveling by train can be a relaxing experience, but it isn't for everyone. If you get upset by delays, then riding the train isn't for you. If you have a plane to catch out of LAX, make sure you're train arrives in Los Angeles the day before you flight, because the train just might be ten hours late. The only thing that's guaranteed is that the departure time will be at or after the time on your tickets. If you have a layover in Chicago connecting to the Southwest Chief, the train will be leaving at 3:15. If you were scheduled to get there at 9am you may be late, so don't plan on six hours in the Windy City. If you want to see Chicago, spend the night and you'll at least get half day there. If you're catching the train somewhere that it doesn't originate (depending upon where you're going, western trains originate in LA, Chicago, Seattle, Portland, and I believe New Orleans) then the scheduled departure time is subject to delay. And a final though about delays: I talk alot about delays when describing train travel. I do it because it happens, and it happens on almost every trip. But I want to leave with these two photos taken from my trips from California to North Carolina several years ago. 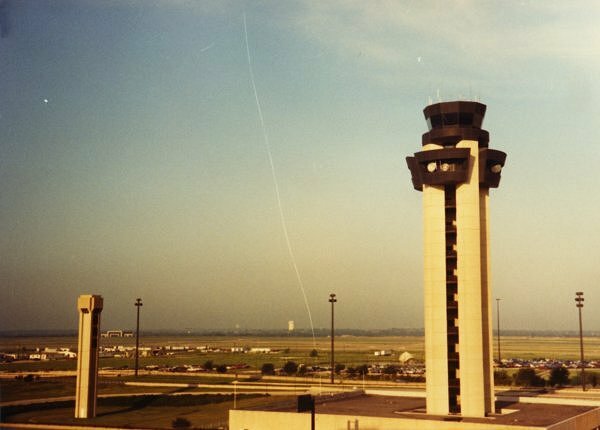 This is of the control tower at Dallas/Ft. Worth International Airport. It was taken in 1989 on my return from North Carolina. It seemed that we got delayed an hour or two at the gate, inside the airplane in Raleigh, North Carolina because, as the eventual announcement said, we "didn't have a crew". I never did understand that, but because of this lack of a crew I missed my connection in Dallas to Denver, so I got to spend the night in a hotel with this lovely view. This one is my favorite. This is at Newark International in New Jersey. Our plane was stuck on the ground for three and a half hours because of weather. 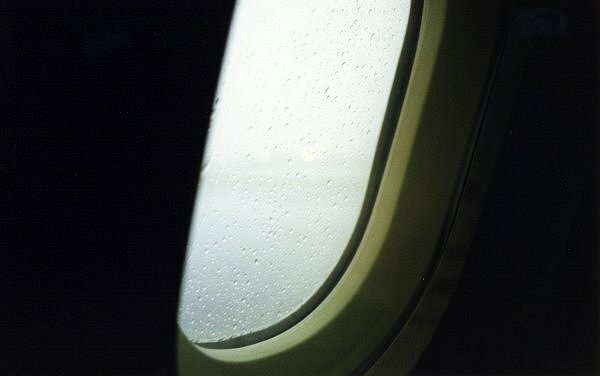 Again, we were inside the airplane, parked in a holding area. I would much rather be ten hours late in a train with a lounge, interesting people and scenery, and the ability to walk up and down a few hundred feet of train than stuck in an eighteen-inch wide seat staring out a porthole for an hour. Website and photography copyright by Darin Volpe except where noted.